But that otherwise draws to a close our coverage of today's Premiership rugby. Thanks for joining us - we'll see you again tomorrow for Saracens v Wasps! Tom Homer's kicking and a much-improved second half earns Bath a crucial victory over Worcester in the Premiership. Click here for the full report. Northampton Saints continue their push for the play-offs with a five-try victory over bottom-of-the-table London Irish. Click here for the full report. James Hook scores 18 points as Gloucester beat Harlequins and record successive league wins for the first time this season. Click here for the full report. 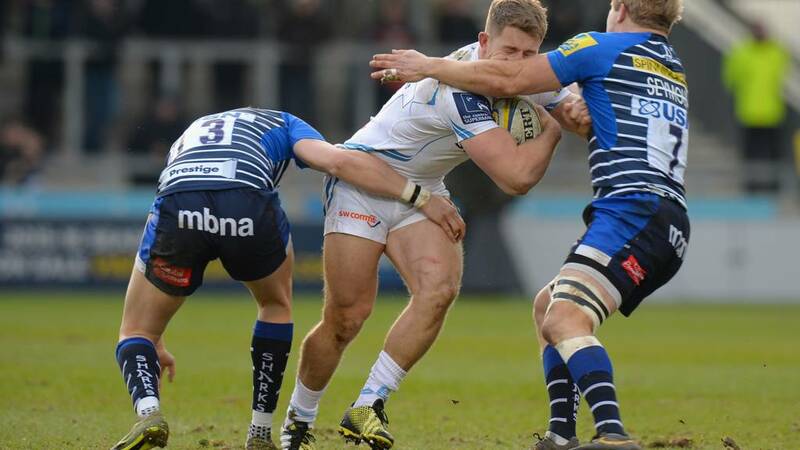 Sale Sharks recorded their sixth win in a row to stun Premiership high-flyers Exeter Chiefs at the AJ Bell Stadium. Click here for the full report. And there's still one more Premiership game to come this weekend too, with high-flying Saracens hosting Wasps at Allianz Park tomorrow. We'll have live text and radio commentary on that one too, with kick-off at 16:00 GMT. Be there or be square. We may have reached full-time in each of this afternoon's four Premiership matches, but today's rugby union is far from done! You can follow all the action from Wales v Scotland in the Six Nations, which got under way just a few moments ago, by clicking here. Bath survive a dramatic late surge from Worcester to come away with a first win in seven games in all competitions at Sixways. Tom Homer's penalty on top of a Jonathan Evans converted try turned around the half-time deficit, and marked a much improved second-half effort. Worcester were unfortunate in that second period, watching Ryan Mills and Tom Heathcote both push kicks wide that would have kept them ahead. However they failed to match their first-half efforts, which saw tries from Cooper Vuna and Donncha O'Callaghan give them a comfortable advantage at the break, and their own winless streak continues. Worcester push... Bath respond... ball comes out on the Worcester side. Warriors forced back but they're still deep in the 22. Clock is already in the red! Drop goal attempt blocked! You can feel the tension. Palpable. Worcester get a late penalty in their own half with a minute to go... it's sent to touch but is then knocked on by Bath in goal. Warriors scrum five metres out! Northampton's victory this afternoon never looked in doubt and they marked the opening of their new Barwell Stand in style. Lee Dickson ignited the side from scrum-half with a pacy performance however it was the work of the big men up front that secured the result. Tom Coventry has plenty to ponder on as Irish remain at the bottom of the table after Newcastle's victory last night. It doesn't get any easier for the Exiles as they have the Exeter Chiefs arriving at the Madjeski next weekend. Worcester will rue these opportunities under pressure. Inside the last four minutes we go on the clock. Gloucester record back-to-back Premiership wins for the first time this season. James Hook contributed 18 points in the first half and Steve McColl went over late to add some polish to a dominant display by the Cherry and Whites against a weakened Quins side, with Chris Robshaw and Mike Brown among five England internationals set to line-up against Italy in the Six Nations in Rome on Sunday. Northampton headed into the final minutes of this match knowing that it was won, however Jim Mallinder won't be happy with their discipline. JJ Hanrahan and Jamie Gibson both received yellow cards and Irish's pack used the extra men to rumble over and give them a consolation score through David Paice. Agonising miss by Ryan Mills from a penalty goal attempt means Worcester are unable to nudge back in front. The groans around Sixways evidence of the anxiety. Billy Twelvetrees leading the way in defence with an immense tacking display, and in a flash there is a turn over, the ball goes through a number of hands and Steve McColl slides over. We're inside the last 10 minutes and it's fair to say that the game has lost a touch of its quality. London Irish are kicking themselves with their own errors and aren't able to make any possession count. While, with a 35-point buffer, Northampton know that they've got this one in the bag! The scoreboard has just about tipped in favour of the visitors, perhaps deserved too after a much-improved second-half showing so far. Scrum penalty went the way of Mike Ford's side and Tom Homer bisected the posts from the tee to edge the Blue, Black and Whites ahead. Little over 10 minutes remaining and it is on a knife-edge between these out-of-form foes. Gloucester's focus is tested as they need to work hard in defence for a moment. Tim Visser scoots away down the left for Harlequins, but a fine Callum Braley tackle and quick thinking by Sione Kalamafoni to kill the ball keeps Quins out. BOOOOOOM! Worcester's Chris Pennell makes a huge hit on Tom Homer to stop his opposite number from scampering over the stripe - all from a clever box-kick by Jonathan Evans down the left. Earlier Tom Heathcote missed a penalty attempt to keep the nerves jangling at Sixways. Still one point in it, and now we're seeing a few changes being made as the sides begin to tire.